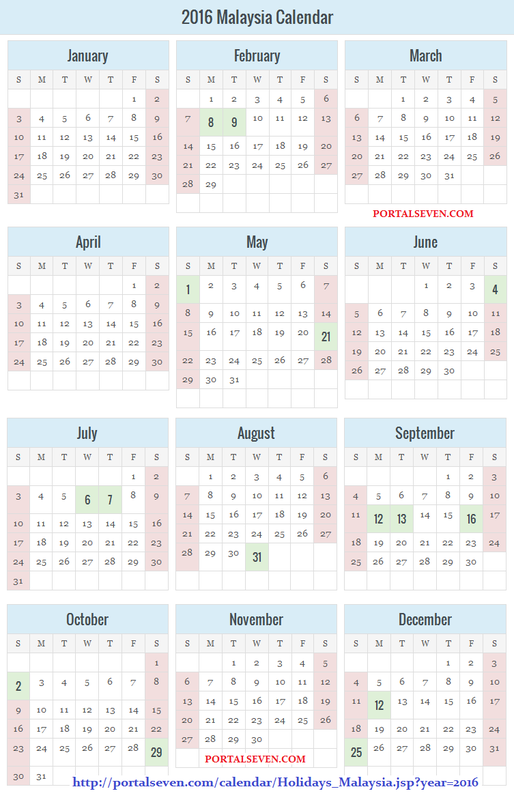 Check 2016 Malaysia Calendar with Federal, State and School Holidays List. 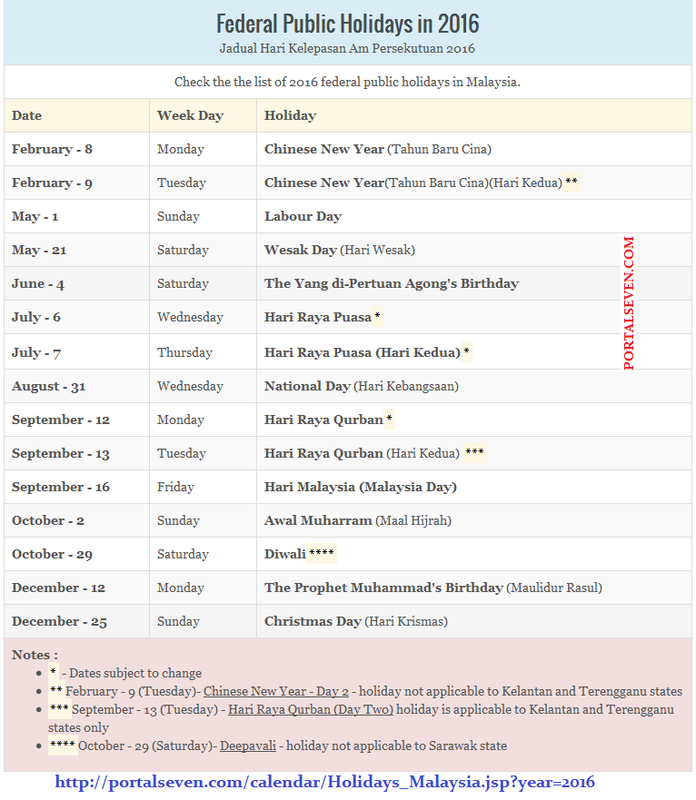 Check the the list of 2016 federal public holidays in Malaysia. Year 2016 calendar for schools in Perlis, Pulau Pinang, Perak, Selangor, Wilayah Persekutuan Kuala Lumpur, N.Sembilan, Melaka, Johor, Pahang, W. Persekutuan Labuan, Sabah, Sarawak and W. Persekutuan Putrajaya. This is the largest and most important annual festival celebrated by Chinese and and Chinese descendants around the world. Chinese New Year Festival is based on the lunar Chinese calendar, begins on first day of the first month in the Chinese calendar and ends with Lantern Festival which is on the 15th day of the first month. The Chinese in Malaysia often hold â€œOpen Houseâ€™, where other races attend and offer greetings or Gong Xi Fa Chaiâ€™. Chinese delicacies and drinks are served and red ang pows are given to the children. On the second day the Chinese New Year,February 4, families gather to â€˜open the new yearâ€™, while at work bosses treat their employees to a dinner. In Malaysia, this is a time when Chinese bosses give bonuses even to those employees who are not Chinese. Eid ul-Fitr is the biggest holiday in Malaysia. Shopping malls and bazaars are usually filled with people days ahead of Idul Fitri, which creates a distinctive festive atmosphere throughout the country, along with traffic mayhem. Many banks, government and private offices are closed for the duration of the Lebaran festivities.It is also known as the festival that marks the end of one month of fasting Ramadan. The words Ã¢â‚¬ËœHari RayaÃ¢â‚¬â„¢ mean 'day of celebration.